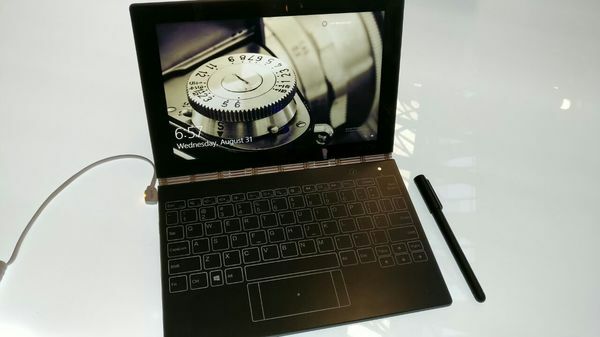 Lenovo introduced yet another device along with Yoga 910. The new device is known as Yoga Tab 3 or Yoga Book. On the first sight we may feel that it is a complete tablet. But when closely examined we can figure out a hybrid device packed with large sized touchpad. This touchpad can be used as scribbling pad also. Now let us have a close look onto the specifics of Yoga Book. Yoga Book comes to be 256*170.8*9.6mm with a weight of 690 grams. The Watchband hinges keep the pad and screen together. The Uni-body metallic design gives it an elegant look. The display of Yoga Book comes to be as wide as 10.10 inches with a resolution of 1200*1920 pixels. The stand-out feature of Yoga Book is its touch pad which is powered by Wacom. It is designed in such a way that it responds to Electromagnetic Resonance (EMR) which provides real time digitization. The backlit keys make this a well-equipped keypad. But the company wants to call it a create pad. You can write on it as if you are writing on a paper notebook or you can create some artistic drawings on your device using this Create Pad. It comes attached with the device with the help of watchband hinges. Yoga Book is powered by Intel Core Atom x5-Z8550 processor with a processing speed of 2.4GHz. This quad core processor is backed by a RAM of 4GB along with an internal storage of 64GB. This can be expanded upto 128GB with the help of external microSD memory card. Yoga Book runs on Android OS of v6.0 Marshmallow. Lenovo will provide an update to latest Android OS Noughat in due time. Yoga is having snappers on its back and front. The main snapper is having 8MP lens and the front cam is having 2MP lens. Yoga Book is having WiFi connectivity with the support of 802.11ac along with Bluetooth of v4.0. The device also supports nano-SIM with 4G connectivity. Yoga Book also supports various sensors like Proximity Sensor, Gyroscope, Ambient Light Sensor and Accelerometer. Yoga Book is having well-equipped battery with a capacity of 8500mAh. This enormous battery will help in keeping the device live for upto 15 hours. Lenovo will release Yoga Book to the market by the end of September. The Android version will cost you $499. Lenovo also launches a Windows 10 version which will cost you $549.